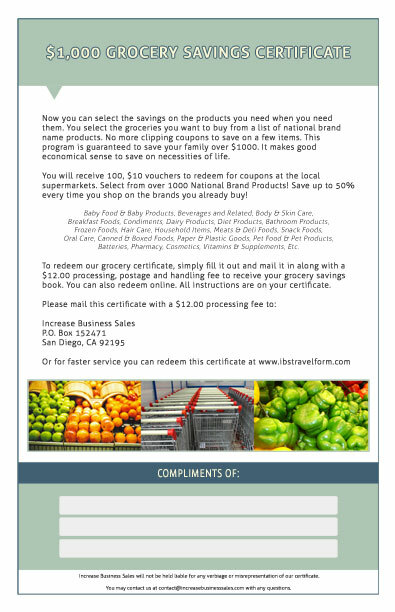 You will receive access to our $1,000 Restaurant Savings Certificates as well as our $1,000 Grocery Savings Certificates. This one-time charge grants you to logon to our Certificate site at your leisure and create/save/print as many certificates as you would like. 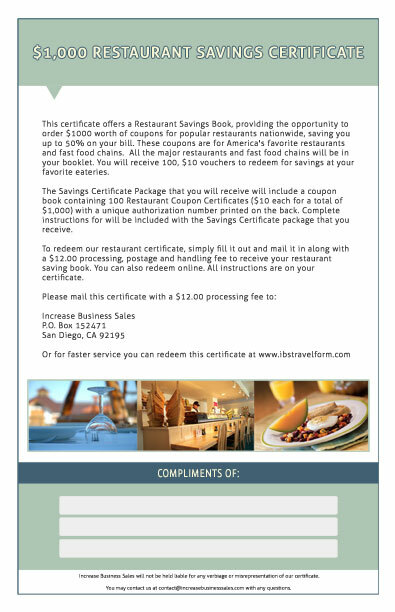 This certificate is redeemable for a Restaurant Savings Book, providing your customers with the opportunity to order $1,000 worth of coupons of their choice for their favorite restaurants and fast food chains. Includes restaurants such as Olive Garden, Red Lobster, Bennigan’s, Ruby Tuesday’s, Applebee’s, Chili’s, Chuck E Cheese, Boston Market, Planet Hollywood, Fresh Choice, Sizzlers, Denny’s, Burger King, Nathan’s, Baskin Robbins, Starbucks, Papa John’s Pizza, Subway, Popeye Chicken, Krispy Kreme Doughnuts, and many other popular restaurants and fast food establishments throughout the US. In the Restaurant Savings Book there are (100) $10.00 Restaurant Coupon Certificates. Each certificate may be redeemed for $10.00 worth of coupons from the fine restaurants listed in the book.